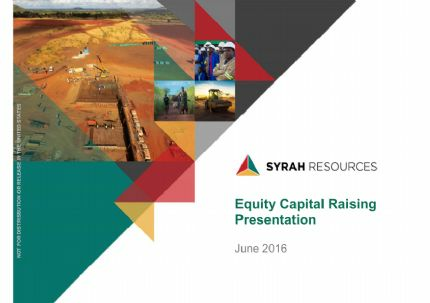 Syrah Resources Limited (Syrah) is an Australia-based company. 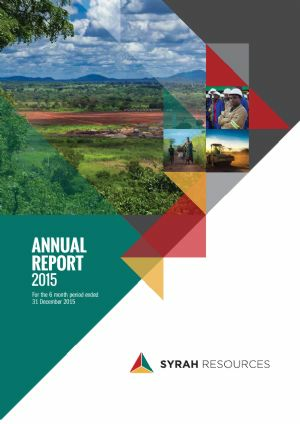 The principal activities of the Company are the exploration and evaluation of mineral resources. The Company operated predominately as an explorer for base and precious metals within Australia. 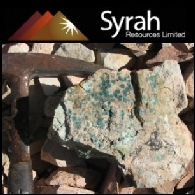 As of June 30, 2009, Syrah was exploring its project areas in Queensland and South Australia. In the Mt Isa Block of NW Queensland, Syrah has three project areas: Levuka, Archie- Mackenzie and Norfolk. The Archie-Mackenzie Project comprises Archie EPM 15073 and Mackenzie EPM 15071, covering a total area of 491 kilometers. The Levuka Project comprises two EPM's located approximately 65 kilometers southeast of Cloncurry and 15 kilometers south of the Eloise mine in the Mt Isa Eastern succession. The Mt Lyndhurst Project comprises two Exploration Licenses. The Norfolk Project comprises three EPM applications. 월요일 호주 증시는 미 달러 급상승의 반등으로 상품가격이 하락함에 따라 자원주 주도의 한산한 거래 속에서 하락세로 마감했다. S&P/ASX200 지수는 25.7포인트(0.6%) 하락한 4676.5를 기록했고, AO 지수는 26포인트(0.6%) 하락한 4695.2를 기록했다.